Set up and configure your Roku, install any desired apps such as Netflix or Amazon. Once connected, you'll be able to set up and use Activities which include your Roku. Select ENTERTAINMENT DEVICE and enter manufacturer Roku followed by your Roku model number. Continue through the series of questions to build your Watch Roku Activity. 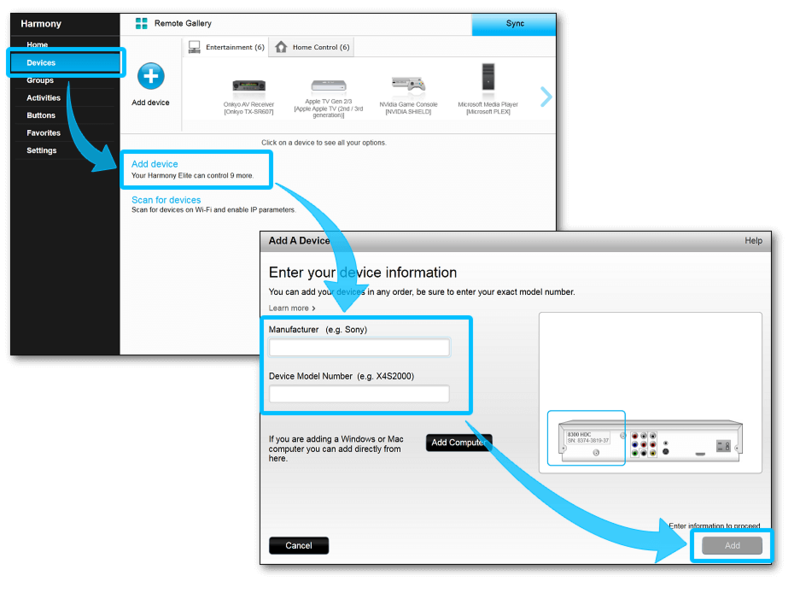 Once you have selected your devices and inputs, Harmony will also prompt you to select a starting favorite channel. Once created, Harmony will be able to control your Roku. Enter the manufacturer Roku and your model number (e.g., Roku 2, Roku 3, or Roku 4). If you have a Roku TV, enter its specific information such as manufacturer TCL and model number 32S4610R. You will be prompted to connect your Harmony to your computer with the provided USB cable. Harmony will scan your home Wi‑Fi network for Roku players. Ensure both Roku and Harmony Hub are on the same Wi‑Fi network. Select the Watch Roku Activity type and select Next. Once done, remember to sync your remote after making any changes. The starting channel feature is only possible when setting up an Activity using the Harmony mobile app. Control icon lists commonly used Roku buttons. Gestures allows you to control your Activity using simple swipe gestures over your phone screen. For example, swiping up/down will change your volume and left/right can rewind and fast-forward. Favorites will display all your Roku channels for easy switching. Voiceand Text entry allows you to use your mobile device's keyboard and/or microphone for text input. Direction Pad Navigation will navigate the Sling TV app. Media Keys will operate differently depending on what the TV network allows. The behavior of other channels may vary depending on its design. Some channels may require the use of the Roku original remote. These are typically games that make use of motion control. A message, "Roku Enhanced Remote not detected" will appear on your television screen when launching an app that requires the Roku remote. Looking for the * button? This may be listed as "Options" or "Options*" on your remote or mobile screen. If you don't see this button, you may customize your remote screen or if you prefer, the Harmony mobile app screen. 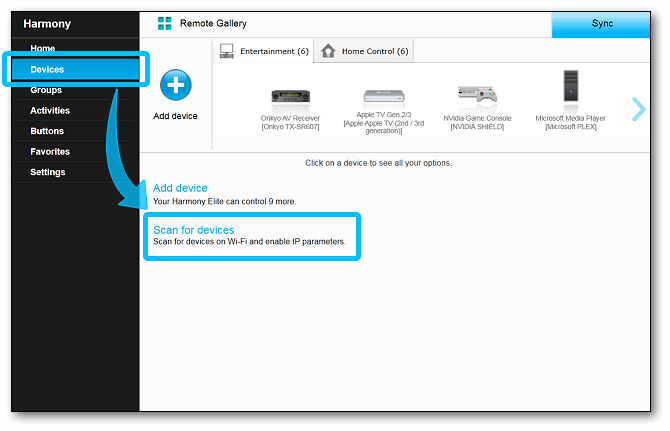 Harmony automatically imports your Roku channels and displays them under the favorites section on your Harmony remote. Commands specific to your Watch Roku Activity are also displayed for which you can add, remove or rename them. You can view common Roku commands on your phone or tablet screen. You can add, remove or rearrange these commands. Harmony allows you to import your Roku channels and launch one automatically when you start your Watch Roku Activity. With this, you can create specific Watch Netflix, or Watch Hulu Activities that go directly to those channels. Create unique Activities such as a "Breakfast Shows" that may open your blinds, turn on your lights and opens the YouTube channel on Roku. The Harmony mobile app prompts you to create an Activity after adding a new device, such as your Roku. If you didn't create an Activity, or would like to edit it, follow these steps. To create a new Roku Activity, select ADD ACTIVITY. You may have multiple Activities that launch different channels. To edit the starting channel for an existing Roku Activity, first select that Activity, then click STARTING CHANNEL. Harmony will ask you if you'd like to select a Roku channel when this Activity first launches. Skipping this step will display the last active channel. Selection a specific channel will always start that app. You can choose a news app for a Good Morning Activity, or YouTube for an after work Relax Activity. If you own a Television that has Roku OS built into it, we recommend using your voice to change between inputs for watching live tv and transitioning to Roku OS app content. Using the Harmony Express remote to navigate between the inputs will cause the devices to be out of sync in when you try to control them. Your Harmony Express remote connects with your Alexa account, allowing you to control your Roku. If you’ve been using another Alexa-enabled device to control your Roku and have added the Roku Alexa skill, there may be voice commands that conflict with Harmony Express. If you’ve previously added the Roku Alexa skill and are having issues with your setup; such as turning on/off devices, switching inputs, adjusting the volume, or other controls, you can fix any conflicts between the Roku skill and Harmony Express by holding down the OK button on your remote and saying “turn on Roku”. When using this method, subsequent commands will come exclusively from Harmony Express and will not use the Roku Alexa skill. If this doesn't resolve your issue, we recommend reviewing Harmony Express voice commands to ensure commands are being used correctly. Harmony Hub connects with Roku through your home's Wi‑Fi network allowing you to navigate and control using either your Harmomy remote or the Harmony mobile app. Please ensure Roku is connected to the same Wi‑Fi network as your Harmony hub. Roku 1, Roku 2, Roku 3, Roku 4, and Roku TV may be controlled using infrared (IR) signals that are sent directly from your Harmony remote. Roku Streaming Stick does not have IR capabilities and cannot be controlled with Harmony IR remotes. Harmony uses your Wi-Fi network to launch apps (e.g., YouTube or Netflix). Some Roku devices send infrared (IR) signals for device control, such as adjusting the volume or changing the channel.